The School Communications Company – Creating valuable communications tools and revenue for schools. Advertise to Parents - The School Communications Company - Creating valuable communications tools and revenue for schools. 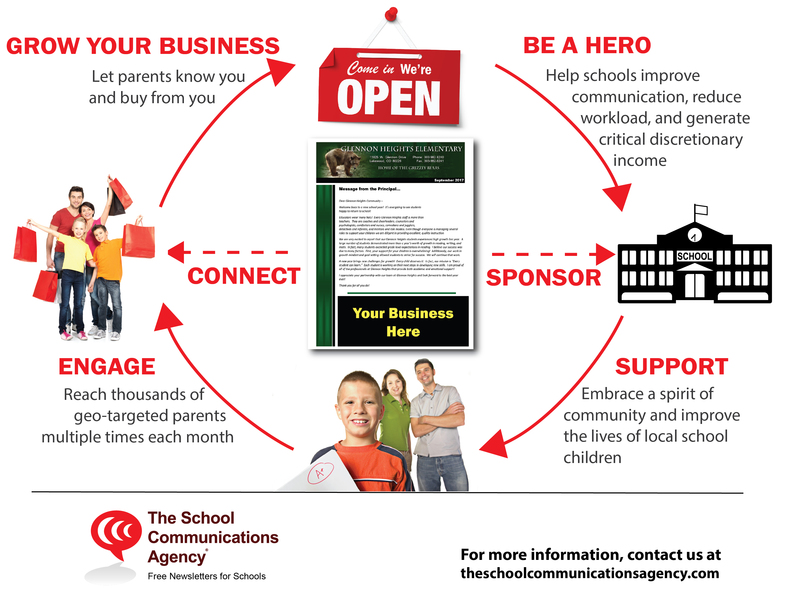 Advertise to Parents - The School Communications Company - Creating valuable communications tools and revenue for schools. Do you want to reach parents? The process is simple, we place an ad of your business in the school newsletter and mobile application. An excellent way to build a strong brand reflecting community engagement and support. Advertise to a geo-targeted audience. Your ad will reach thousands of parents and school staff in your area. If your business depends on parents or families, you need to place an ad in our newsletter now! Support your community and be a hero. Did you know that a portion of your advertising investment goes right back to the schools you sponsor? Know that you are supporting your community, while also raising awareness about your business. What Do Advertisers Think About Us? I became familiar with Cynthia Hall over coffee one day after becoming interested in knowing how to advertise in the Leawood Elementary School’s newsletter. I teach piano and my grandson goes to that school, so I am familiar with some of the folks that attend. I was so happy when 4 different families responded to my ad! It was how Cynthia laid out the ad and how it was put together, colors, words, and using my logo. Thank you, Cynthia and the others at TSCA Schools, for doing such a fine job for me. Now I start the new year with 4 more students! They are happy and I am happy. Cynthia was so easy to work with and so accommodating. Thank you so much! I look forward to continue to use your services! The School Communications Agency is an excellent way to promote your small business and Janeen is wonderful to work with! I have received a significant amount of business from advertising my local tutoring company through the Newsletter program, and I love the fact that the schools benefit as well! Thanks to these businesses, we helped raise over $500,000 for Colorado schools in the last 3 years!